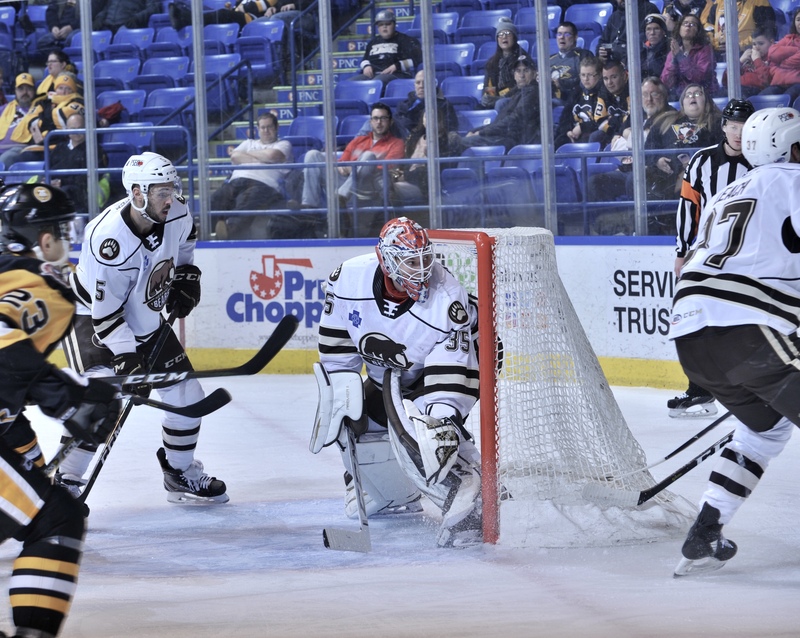 The Hershey Bears beat the Wilkes-Barre/Scranton Penguins 5-3 Saturday afternoon at the Mohegan Sun in Wilkes-Barre. The win raises the Bears record to 19-20-0-2 on the season. The Bears are back on the ice on Monday when they visit the Sound Tigers in Bridgeport. Puck drop has been rescheduled for 1:00 PM. The Bears would strike first with a power play goal from Mike Sgarbossa and added a tally from Shane Gersich late in the period for a 2-0 lead at the first intermission. The Penguins would close the gap with a 5-on-3 power play goal to make it 2-1 at the second break. The Bears would make it 3-1 with a goal from Jayson Megna early in the final frame, but the Pens responds moments later to make it 3-2. Riley Barber would restore the Bears two goal lead with the Bears third power play goal of the game, making it 4-2. Jayson Megna would add a short handed goal late and the Penguins would also score late for the 5-3 win. Scratches: Scratches: Colby Williams (lower body), Lucas Johansen (upper body), Kris Bindulis (upper body), Steve Whitney (injury) were the injury scratches. Steve Johnson and Mason Mitchell were the healthy scratches. The Bears opened the scoring with a power play goal from Mike Sgarbossa at 8:10 of the first period. Riley Barber (19) and Aaron Ness (22) were credited with the helpers. The This was the 10th straight game the Bears have scored first. Shane Gersich would give the Bears a 2-0 lead with a snipe from the left side at 17:26 of the first period. Brain Pinho (4) and Jayson Megna (10) were credited with the assists. The first period would end with the Bears leading 2-0. The Bears outshot the Penguins 11-6 for the first 20 minutes. The Bears were 1 for 2 and the Penguins were 0 for 2 on the power play. The Penguins had a 5-on-3 for a full two minutes with a little less tan nine minutes remaining in the middle frame, and the Penguins would capitalize. Adam Johnson would close the gap to a goal at 12:44 of the middle frame. The goal snapped Ilya Samsonov’s shutout streak of more than two games. The Bears led 2-1 at the second intermission. The Bears outshot the Penguins 12-9 for the second frame, and led 23-15 after 40 minutes of play. The Bears were 1 for 5 and the Penguins 1 for 6 on the power play after 40 minutes of play. The Bears would restore their two goal lead with a nice centering pass from Mike Sgarbossa to Jayson Megna for a power play goal at 2:50 of the final frame. But the Penguins would respond. Teddy Blueger would make it 3-2 with a tally at 3:53 of the third period. Shane Gersich was blasted with a dirty hit at center ice and Connor Hobbs took exception, dropping the gloves with Cramarossa. The Bears would once again restore their two goal lead with their third power play goal of the game. This time Riley Barber would cash in at 5:51 of the final frame, making it 4-2. Aaron Ness (24) and Mike Sgarbossa (16) were credited with the assists. Jayson Megna would make it 5-2 with a short-handed goal at 16:02. It looked like Megna lost control of the puck, which continued between the pads of Peters. The Penguins would add one late for the 5-3 final. The Bears have scored first in their last 10 games. The Bears have now won a season-high four straight. The Bears have beat the Penguins in six of the nine meetings so far this season. Jayson Megna had two goals against his former team. Aaron Ness recorded three assists. Ilya Samsonov stopped 22 of 25 shots. The Bears outshot the Penguins 30-25 for the game. The Bears were 3 for 8 and the Penguins 2 for 7 on the power play. Riley Barber led the Bears in shots with 6 for the game. This entry was posted in News and tagged Hershey Bears, Jayson Megna, Jon Sorensen, Mike Sgarbossa, Riley Barber, Shane Gersich, Wilkes-Barre/Scanton Penguins. Bookmark the permalink.